Scientists at Stanford and Seoul National University have built artificial sensory nerves that can mimic the sensitivity of natural skin. In the study the artificial nerves were able to activate the twitch reflex in a cockroach and identify letters in the Braille alphabet. Scientists believe findings might one day help patients with artificial limbs touch and feel sensation and pressure or even give robots some type of reflex capability. The Xu Wentao team of the school of electronic information and optical engineering, Nankai University, worked with scientists in the United States and South Korea in this project which was published in the journal Science. With thousands of sensors for sensing temperature, pressure, location and other information, human skin is a complex system. These messages are modified to neural signals and are transmitted in peripheral nerves and central nerves in a gradual manner. They will decipher more new skills if they can have a skin-like touch that can feel pressure, temperature, or even neural activity. Photo: Amir M. Foudeh/Yeongin Kim/Zhenan BAo/Tae-Woo Lee. The scientists have successfully simulated the artificial human SA-I tactile nerve, which is made up of flexible organic materials. This sensory nerve is made up of 3 core components: a resistance pressure sensor, an organic ring oscillator, and a synaptic transistor. Here’s how it works: The system first uses an array of sensors to identify very subtle pressure, and produces an equivalent voltage change, and then makes the voltage transform into an electric pulse signal through a ring oscillator, which is actually an artificial nerve fiber. The electrical signals received by multiple ring oscillators are converted into synaptic currents by synaptic transistor integration, and then sent to the next level nerves. Using the system the research team was able to read Braille as would a blind person and to measure the movement of an object coming in contact with the material. 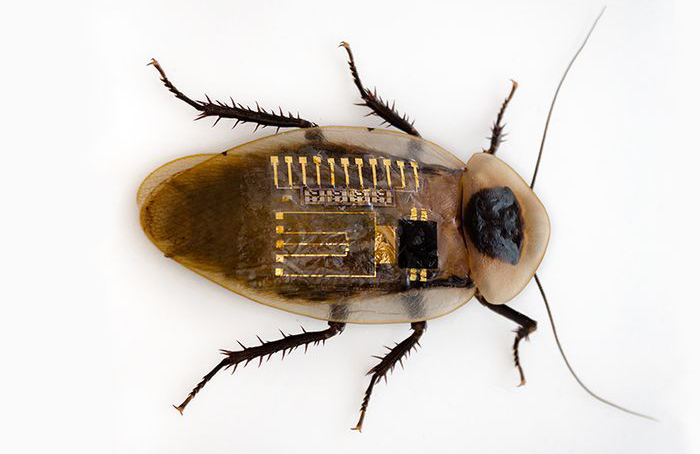 The researchers tested the system on a cockroach and found that its legs actuated in response to the pressure sensors activating synaptic transistors. The ingredients of these artificial nerves are flexible organic materials and are very cheap to manufacture, which may make it easier for scientists to eventually add in many artificial nerves to help pick up different types of sensory information. The results of this study could someday help people with artificial limbs to regain a sense of touch, and allow robots to interact in a new way, which could help them take on more gentle roles, such as taking care of humans with a tender touch.